While the shamans conjured all manner of wonders, it was more difficult to keep these wonders running. Enter the Priest-Mechanics. The Priest-Mechanics were themselves actually a separate order of shaman. Instead of relying on carved runes, they surgically altered themselves, embedding mechanical devices into their bodies to increase their ability to synchronize with the devices they had to repair. Anyone wanting to resurrect Pyre’s ancient technology would love this district. Unfortunately, it’s full of damaged constructs from the height of Twilight, some still functioning (or ready to activate when a stranger draws near). It’s a nightmare world of insane clockwork and ever-vigilant mechanical eyes. The district is covered in workshops, junkyards, and the occasional pub. The arches and clocks of the Guild Hall rise like a baroque music box near the center of the district. The outer edges of the city are composed mostly of smaller workshops, for those who needed a quick repair. The first workshop the players encounter is a cozy stone building, surrounded by a fence, within which is a small scrapyard. It has no physical defenses, though some kind of barrier keeps any and all foreign constructs out of it. The players can easily work their way through the fence and into the building. In the scrapyard, a green sphere rolls towards the players. Two tiny eyes light up, and it announces its name, Ora. It immediately expresses surprise at the sorry state of the Priest-Mechanics’ District. Ora was built as a companion and customer liason by a Priest-Mechanic named Pell, a young man of some talent in building constructs, who owned and lived in this workshop. Ora was switched off in the middle of Twilight, and was confined to the Priest-Mechanics’ District, so its knowledge is relatively constrained, but Ora will gladly chat about Pyre during its zenith. Ora can explain that the Priest-Mechanics were a loosely organized group of highly focused engineers. During Twilight, one of the most respected Priest-Mechanics, a man named Tallin, announced his plans to safeguard Pyre’s technology, and was enlisting the help of the few Priest-Mechanics who paid attention. Ora was switched off before Tallin’s plans came to fruition. Ora can also explain the overall layout of the district, as shown on the map. Ora will not venture outside of the fence surrounding Pell’s workshop, and has no offensive or defensive capabilities. This is a large complex containing half a dozen large warehouses, surrounding a small hut. 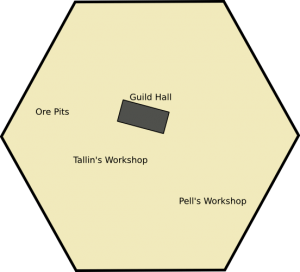 The warehouses are empty, except for a few piles of precious metals and constructs (functional or not, depending on your whim and the party’s desire to fight). With one exception: one warehouse is filled with hundreds of wooden racks, twenty feet high with ladders on grooves. They used to contain vials of some sort, but they were clearly well-looted. The floor is covered with several inches of crushed glass. If the party searches enough, though, they’ll find several thin vials containing a strange, viscous, semi-transparent white liquid that is very explosive. The hut in the center of the complex is simply a canvas roof for a large metal hatch in the ground. The hatch is very heavy and very solidly locked. You may allow the players to force it open with a suitably high check, or use the explosive vials to blast it open. A vertical shaft carved out of solid rock leads straight down. 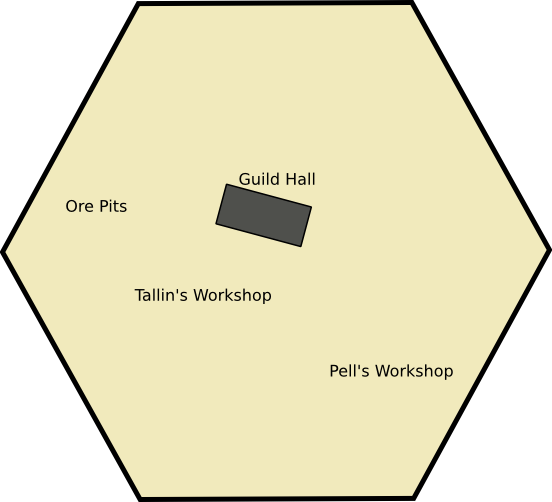 If you feel so inclined, you can find or create an intricate complex as Tallin’s underground home, or let it be one room. Either way, Tallin’s bed chamber is almost perfectly preserved. It contains a very nice wooden bed with sheets as soft as a girl’s cheek, a chair, and a desk that runs an entire wall. The wall is covered with technical drawings and charts. On the desk lay a number of precious gems, and several crystals (three green and one red). In a corner of the room lies a milky-white orb six inches wide. This is Trelawney’s phylactery (see page 22); it has 40 hit points and resist 10 to all damage, and can be easily detected as such by anyone with appropriate magical ability. The green crystals contain a set of video diaries by Tallin, where he describes a project assigned to him by the Council, to build the Defenders. He never explains exactly what Defenders are, only that he knows their purpose is to slaughter the wizards and shifters, and that he’s uneasy about this. He’s building them, and is excited about the technical challenge, but hints that he’s unsure about handing these over to the Council. The red crystals do nothing here. This is a fantastic mishmash of towers, arches, and walkways, designed and “improved” by hundreds of Priest-Mechanics over the years. It is very well-guarded by intelligent constructs that work in concert and have been unrepaired over the centuries. In the center of the Hall lies a locked vault, within which lie a (completely inactive) sleek, elite Oriforged Construct and six humanoid metal machines, each about eight feet tall. These machines are the Defenders. They are essentially clockwork suits of armor; a humanoid can climb into one and use it like a vehicle. However, in the center of each Defender is a small slot, where a red crystal must go, and only one red crystal remains. Once the Defender is activated, the Construct awakens, and is entirely friendly to the party. It calls itself D.A.S.C., the Defender Assistance System and Construct, and explains how to work the Defender. It accompanies the Defender wherever it goes, and will gladly assist the party in battle. D.A.S.C. knows about as much about Pyre as Ora does, but can also fill in more details about Twilight and Tallin. Tallin didn’t trust the Council, so as Twilight fell, he slipped the Defenders into the Guild Hall—with the help of a number of sympathetic Priest-Mechanics—to protect their technology. In fact, there’s a sealed chamber beneath the Defender’s vault, which contains detailed specifications on Pyre’s technology. Unfortunately, Tallin did not appear to leave any information on how to get into that sealed chamber, and D.A.S.C. doesn’t even know where the door is (the floor appears completely solid).